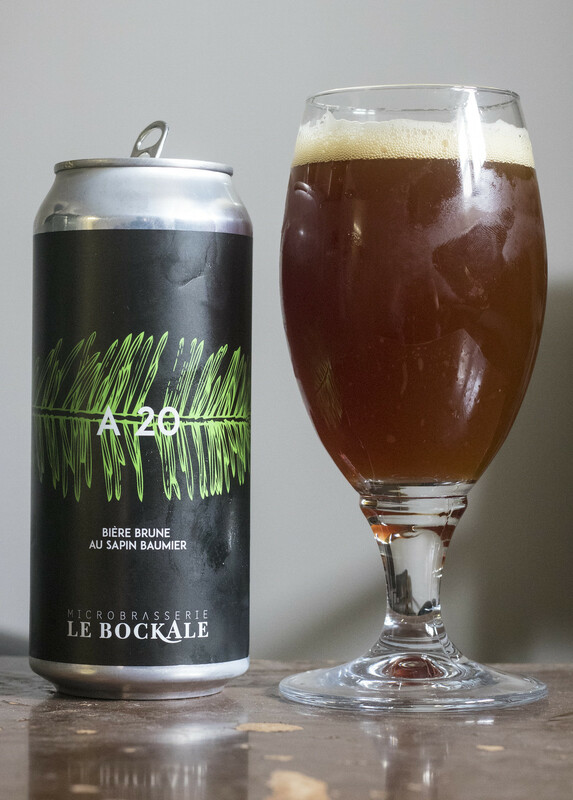 Microbrasserie Le Bockale's A 20 is the brewery's Balsam fir (sapin baumier) brown ale. I've never had a Balsam fir beer before but I expect it will be a bit like a spruce ale. So, this is a beer that incorporates only hops, malt and Balsam fir from Quebec, thus giving it the name A 20, named after Autoroute 20, the stretch of the Trans Canada that goes through much of the province. Appearance: A 20 pours a murky, muddy brown ale with a bit of a caramel brown hue to it, minimal carbonation and a yellow-beige head on top, good amount of lacing. Aroma: Very herbal and woody. There's a fir tip aroma that I can't describe as I've never smelled Balsam fir before this beer - it's a bit like spruce but a bit muskier, somewhat peppery and lightly smoky. It's fairly woody, a bit sweet - giving off a bit of a bit of a caramel aroma to it. The Balsam fir tips and the aroma of wood seems to be the dominating theme in this beer though. Taste: Incredibly woody tasting beer with a good amount of smokiness and an herbal fir tip flavour to it. I feel that it might be a bit too much for me, it's incredibly woody, herbal and a hint of a flavour that's reminiscent to dill. The smokiness of this beer leaves behind a lingering aftertaste that remains on my palate long after the beer is finished. There's a bit of a piney hop presence but it's over powered by the woodiness. Overall Thoughts: Not a fan, overly woody, herbal.. I find the flavours just clash, I'd be happy with some of these flavours on their own but the combo of dill, wood, fir, smoke and caramel... it's definitely interesting to try but I won't have it again.